This is a brief user guide of VeryPDF Free Online Invoice Maker. You can understand how to use it to create an invoice with the following instructions. Click to go to VeryPDF Free Online Invoice Maker. As an invoice maker, users can edit any text fields provided by the online tool. Click the text area and then the text background will turn yellow showing that the text is editable. As displayed in Figure 1, you can input your company's name when the background of the text area is yellow. Users can freely set the item descriptions to the names of their products or services. Click the item form, and input your specified text when the background is yellow. You can see an example in Figure 2. You can input the quantity of items and the unit price in the meantime. The total price will be calculated automatically. If you need more item rows than the preset, you can click Add row to add one new row to the form. If you have to clear the empty rows, just click Delete row to remove one row. 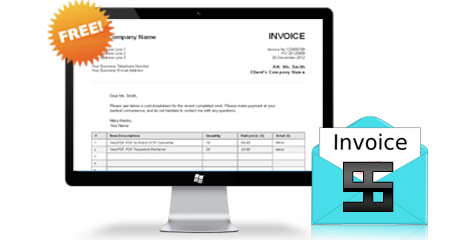 After you have finished editing the invoice, click Get PDF to download the invoice to your computer in PDF format. If you need to save the invoice in an email box, you can click Send Email and then input an email address in mail to input box. The invoice will be sent to your specified email box by the VeryPDF mail server. Now click to use the powerful free online invoice maker.